David Price is one of the best young pitchers to enter the league in years (keithallisonphoto.com). When the Tampa Bay Devil Rays once again had the number one overall pick in the 2007 First-Year Player Draft, it was no surprise when they chose a lanky-lefty from Vanderbilt. The 6-foot-6 college star named David Price was a shoe in to be the first overall pick in the draft. This kid is not only good, he’s the best pitcher to come out of college in many, many years. So what makes him so special? History: David Price has been dominating hitters for as long as anyone can remember. His stellar career started off in the small town of Murfreesboro, Tennessee pitching for Blackman High School where he would compile a 0.43 ERA and 151 strikeouts. Price would also win many, many awards for his efforts including the Rutherford County MVP Pitcher in 2003 and 2004, the Co-District 7AAA Pitcher of the Year in his senior season, the Rutherford County Male Athlete of the Year in 2002, 2003, and 2004, and also received the honor of playing in the 2004 High School All-American Game his senior season. All of this success at such a young age was only the beginning for Mr. Price. Just as Price had set records and won awards for his brilliance on the mound in high school, he would continue this as he attended Vanderbilt University. As a freshman, Price received the honor of being named a Freshman All-American by both Baseball America and Collegiate Baseball after posting a 2-4 record, a 2.86 ERA, and racking up 92 strikeouts in only 19 games and 69.1 innings. The following season Price didn’t have as dazzling of a stat line, but he did set a school single season record with 155 strikeouts (he also only gave up 43 walks for a 3.6 K/BB ratio) including one game with 17 against Arkansas. As impressive as his first two college seasons were, he definitely saved the best for last. In his junior season (which would be his last collegiate season) Price would go 11-1 with a 2.63 ERA and would shatter his old school record as he lead the nation with 194 strikeouts (his K/BB ratio this time was an unbelievable 6.26). Price would win many awards that season but none greater than his winning of college baseball’s top honor, the Golden Spikes Award. As sad as Vanderbilt’s team was to see him go, it was time for him to move on. Before we get into the 2007 draft, it is important to note Price’s great work while playing for our country. In 2005 Price was a member of the United States National team where he went 2-0 with a 1.26 ERA and 39 strikeouts. 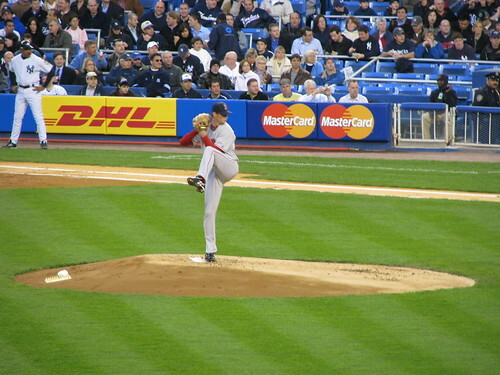 Then in the summer of 2006, Price helped the United States win the gold medal in the World University Championships in Cuba. Price would post impressive numbers again going 5-1 with a minuet 0.20 ERA. The world was now on notice of just how good this kid really was. With a laundry list of awards, achievements, and records attached to his name, David Price had pretty much made a fool-proof case for himself to be drafted first overall in the 2007 First-Year Player Draft. So with Tampa Bay possessing the first overall pick, it was a no-brainer for them to choose the dominating lefty. 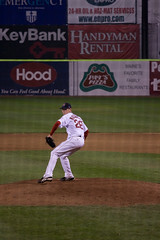 Price would go on to sign his first ever contract on August 15, 2007 for six-years and $8.5 million. This of course came with a $5.6 million signing bonus which stands as the second highest bonus in MLB history behind Justin Upton’s $6.1 million following the 2005 draft. This was the third highest guaranteed contract ever for a draft pick and was well worth the money for such a special talent. To see what this much money gets you (other than the obvious that we just covered) is a player with a glimmering scouting report. The Diamond Cutter scouting report that I have built shows not only how talented this kid is but, as scary as this sounds, show’s he still has a little room for improvement. Scouting Report: Price’s money pitch has always been his dominating plus-fastball which sits at about 90-94 mph (it can sometimes reach upwards of 95). As a lefty, what makes him even more difficult to hit is that his fastball has excellent tailing action that moves away from right-handed hitters. This really gives no one, right or left-handers, any advantage. The two other pitches he mixes in are a 77-79 mph slurve and a plus-slider that ranges around 84-86 mph. He uses his slider very well in two-strike counts making it very difficult for hitters expecting a fastball. Price is also working on a changeup pitch to add to his arsenal (one of the areas for improvement I mentioned). Right now it is average at best but if he can work on not tipping it off by dropping his arm slot when throwing it, he could develop it as a third plus-pitch making him even more difficult to hit. This is one area the Devil Rays organization will be working very closely with him on. Another area that can sometimes hamper Price is his control. 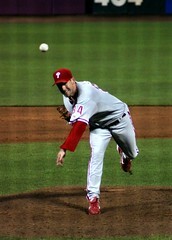 While it doesn’t happen much, occasionally he can lose control of the strike zone and start allowing walks to pile up. This happens when his mechanics begin to get shaky and he loses his fluid delivery. He very rarely walks hitters which can be seen with his very low BB/9 ratios so as long as he can keep his rhythm going with this delivery he will be just fine. Price has the make-up, the athleticism, the overpowering stuff, and mentality to be a frontline starter in the Majors for many, many years. Once he harnesses his developing changeup as a third plus-pitch, he will be virtually unstoppable and one of the elite pitchers in the game. With a glowing resume like this its no wonder that once Tampa Bay learned they had the first overall pick that they knew they could put their feet up and relax. Because when a star like this falls into your lap it tends to make your job very, very easy. Blanks is a true masher (SD Dirk/Flickr). There are a lot of fantastic young players who will get a crack at playing their first full season in the bigs this year that I am very excited about. 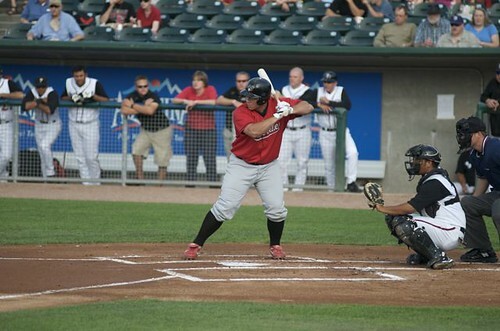 One of those young guns is a 6-foot-6 masher named Kyle Blanks of the San Diego Padres. 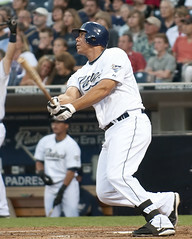 Blanks was drafted all the way in the 42 round of the 2004 draft out of Yavapai Community College in Arizona. The big, lanky right handed slugger is generally thought to be a first baseman but is able to handle himself in the outfield. This is a good thing considering there’s currently a giant road block at first base by the name of Adrian Gonzalez. The really intriguing thing about Blanks is his proven ability to hit for both average and power – something someone his age and stature generally don’t carry hand-in-hand. He has continually improved his plate discipline which is the key to him reaching his full potential which I see as a Frank Thomas/Jermaine Dye type hitter. That’s a pretty high standard to live up to. Blanks is one of those guys who I am very excited to see how he progresses this, his first full, season in the big leagues. In only 172 plate appearances last season for the Padres, Blanks put together a solid line of .250/.355/.514 with 10 HR, 22 RBI and .264 ISO. Pretty impressive start. As you can see CHONE isn’t projecting Blanks as highly as Bill James and I are. CHONE also has him only having 416 plate appearances too where James and I both see him being essentially an every day player. I really do see Blanks being an annual home run force and competing for the crown on a yearly basis with this year being his coming out party. I also see Blanks’ batting average and on-base percentage growing in the coming years and giving Padres fans something to cheer about with the impending loss of Mr. Gonzalez in the next couple seasons. Even big old PetCo can’t hold this monster. Wallace is on the move again, this time to Toronto (mwlguide/Flickr). Son of former Major League pitcher, Doug Drabek, Kyle may even be better than his old man. Despite a strong mid-90’s fastball, his money pitch is a devastating spike curveball that has a sharp, late drop that kills opposing hitters. Despite some off the field issues, the Phillies hope he enhances his work ethic and continues to blossom into what he is capable of. Wallace’s greatest asset is his approach at the plate. He has very good plate discipline considering his age as it generally takes some time to get everything in synch. But Wallace is the type of hitter who refuses to expand his strike zone and waits pitchers out, forcing them to throw him something he can make solid contact with. Wallace also does a great job in plate coverage thanks to his batting stance which crowds the plate. With his advanced approach, Wallace has the potential to translate his success to the pros and could end up being a perennial on-base machine. I project him a .280-.300 hitter, around .380-.400 OBP and a slugging percentage in the upper .500’s. Then add in his 25-30 homers and 100+ RBI and you have a pretty strong offensive weapon that Albert Pujols will love having hit behind him. With all that said, he is an average defender at third (I view him higher than most) who would be better suited to play first, but with that position locked up, he will do just fine at the hot corner (read my extended scouting report on Wallace with his “Prospect Spotlight“). As you can see I think very high of the youngster and even ranked him at number 12 in last year’s top 25 prospect list. As I have seen more of him I’ve convinced myself that he may not be able to handle staying at third (apparently based on Oakland’s willingness to trade him they feel the same way) as he just has no range. This being said, a move to first in Toronto or preferably DH is what Wallace needs. This trade has continued to build and become bigger and better every day. Lee will now make the best 1-2 punch in baseball with Kind Felix (artolog/Flickr). Diamond Cutter Spin: Wow, what a deal this is looking to be. If this ends up going through (which it looks like it will) the Phillies get an ace locked up for a few years, the Mariners get another stud pitcher to go with King Felix and the Blue Jays reload their farm system. Looks pretty good all the way around. I have to say, while this is a good deal for the Phillies considering Halladay (click here for my coverage and scouting report on Halladay) is locked up for a few seasons in Philly, I am really impressed with how aggressive the Mariners have been this winter. They have now added Chone Figgins to the top of their lineup and Cliff Lee to the front of their rotation to go with Felix Hernandez. They are setting themselves up to give the Angels the fight of their lives especially since the Angels have now lost Figgins and their ace John Lackey (to Boston). Now is the time for the M’s to strike while the Angels are weakened. Anderson has shown signs of brilliance (Kimberly*/Flickr). Scouting Report: We have seen incredible improvement from Anderson over the past two years after showing a lot of growth on the mound. 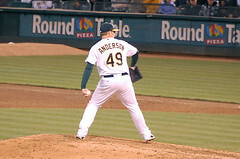 Anderson has always had superb command of his pitches and can work them on either side of the plate. His fastball saw a slight increase hitting as high as 95 mph but sitting more consistently in the low-90’s. What makes him even more effective is the fact that his secondary pitches – a curve, slider and change – can be used as both out pitches or, thanks to his confidence in them, at any point in the count. He has really developed his stuff to the point that he can be dominant on the mound. At this point last season it was difficult to project where he would fall in the rotation. Originally he looked to be a middle of the rotation guy, but thanks to his improvement in his fastball (and his command being his greatest asset) he now projects as a top of the rotation starter that the Oakland A’s have been looking for. You are currently browsing the archives for the Scouting Report category.